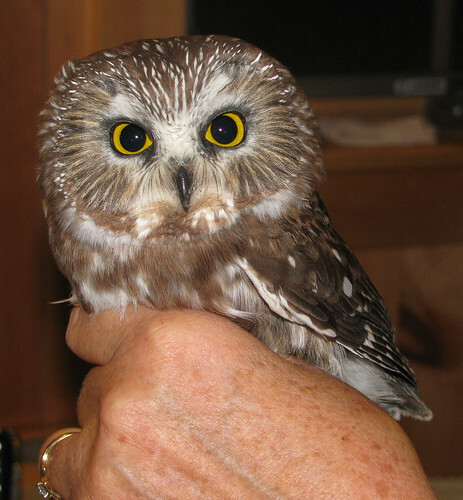 This year, I found out how to volunteer with the owl-banding project. So last night, I had my first volunteering session. I'm alternating Tuesdays with another person, and unfortunately my first night got rained out (can't net the owls in rain or high winds). But last night was fine, if a bit bright -- the moon is nearing full, and it was really gorgeous out there. At times we didn't even need our headlamps. But in moonlight that bright, the owls can see the mist-nets; and they don't like to fly because they can be seen, as well, by other owls who will totally kill and eat them (any owl bigger than them, basically; which is all the other types of owl we have). As a volunteer, I was there to help open up the nets (and close them down later), help do the net runs looking for netted owls (carrying and assisting with the cloth bags the owls would be put into once extracted), take care of the recording of all the data that the banders were measuring, and in the end, get to help release the owls. The banding project is, of course, an exercise in gathering scientific data. A study done in the 70s, complete with blood tests to confirm gender, has resulted in a chart of weights and wing measurements that can give you a pretty good idea of whether you've got a male or a female. 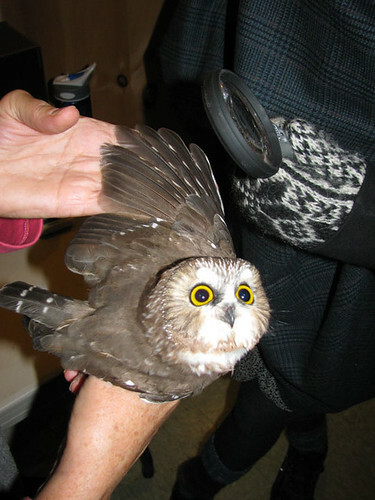 So the owls are weighed, the wing measurement is taken, their age is determined in a rough way, and they are inspected for body fat. Saw-whets probably migrate in the fall because unlike bigger owls, they can't really deal with getting their prey through deep snow. (Or maybe it's because they're more easily predated on in snowy conditions? Or both?) The banding is conducted by setting up these mist-nets (usually used to catch songbirds for banding), and then playing an audio lure of a male saw-whet's call. This draws other owls down to investigate. 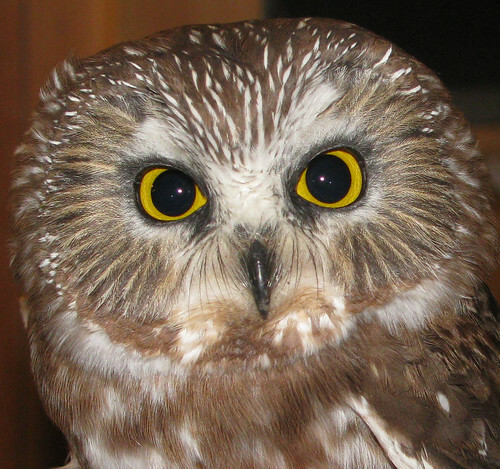 The vast majority of owls netted are females -- is that because it's the male call being played, or is it because the males don't migrate as much as the females do? (Do males stay in territories all year?) That's part of what the study is trying to figure out by gathering all the data. There are over a hundred banding stations across the US and Canada, sharing info via Owl-Net (on the web, of course), and giving their data to the government. Here, the bander is inspecting the wing, which is how you make the rough age determination. 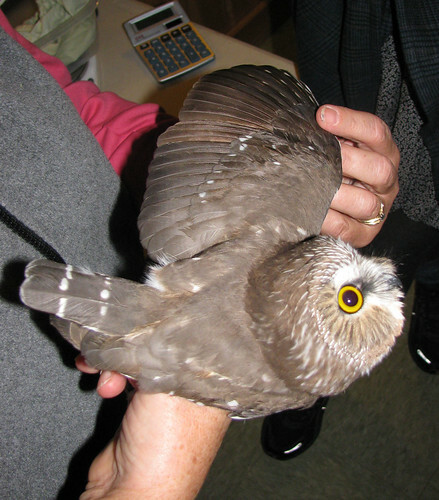 If you look at the feathers, you can see that the ones that are closest to her body and the ones towards the tip are a darker shade of brown, while a section in the middle are a lighter, ruddier shade. If this bird had been hatched this year, all the feathers would be a uniform color. That pattern is a molt pattern, which means she's a second-year or above. That particularly molt pattern is a second-year bird -- the older feathers are still in the center. Above second-year and there would be a different pattern. Watching all of us watch her. Major close-up of the above picture. This is worth clicking through on, to see the largest size, for all the detail of the feathers in the facial disc. The little whiskery-looking things on either side of the beak are, in fact, kind of like whiskers; they function that way, although they're modified feathers (consisting of just shaft). 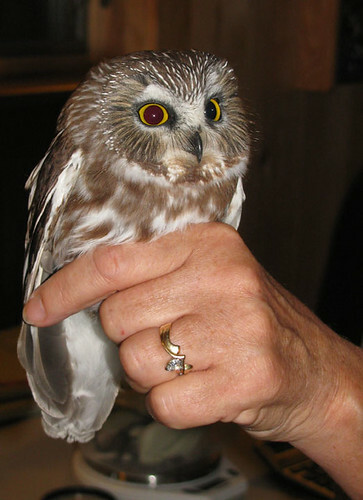 I got to learn how to hold the owl, and how to release it. That was really amazing. You have to hold them with lights out for a few minutes, to be sure their eyes have readjusted, and then you place them on your arm and let them fly away at their own pace. Some leap away almost instantly, but some decide to hang around for a while before wanting to leave. The last owl, who was the recapture from earlier in the night, was caught right when we were closing up the nets for the night. (We put the nets up about 6:45pm and took them down about 10:30pm.) Oddly enough, the moment we turned off the audio lures, a couple of barred owls in the near distance started hooting up a storm, like they were conversing with each other. (We were trying to decide whether it was the resident owl in the cage over on Bird Hill, but once the second owl started up, we realized that at least one of them was a wild owl, possibly both.) They could be heard quite clearly where we were. 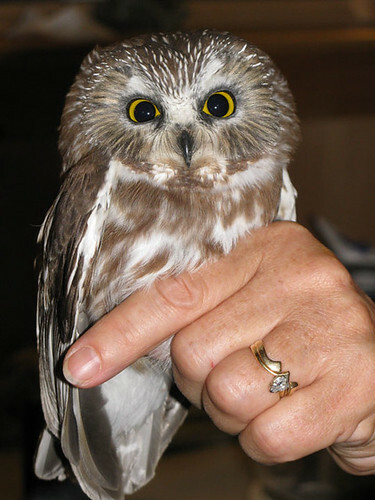 So when I went to release the last owl, I put her on my arm, which I was holding pretty close to my body... and she just stayed, sitting there and looking around, and then blinking up at me. It wasn't until I turned around to give her a straight flight towards a stand of trees that she finally took off. She must have felt like the big, warm human was offering her as much protection against the big bad barred owls as she could get anywhere else! But fortunately she did fly off into some nice dense cover. So, yay! That was a blast. I'm very much looking forward to my next night in two weeks. Crossing fingers that I will have good weather on that night as well.